Shop this collection: 1.On the way to Kashmir mountain photography (M Chiu Shop, $30), 2.Extra wide infinity scarf (Theorium, $28.95), 3.Driftwood feathers print (River Luna, $20), 4.Vintage enamel mug (Lovintagefinds, $12), 5.Small birch house (2of2, $39.50). 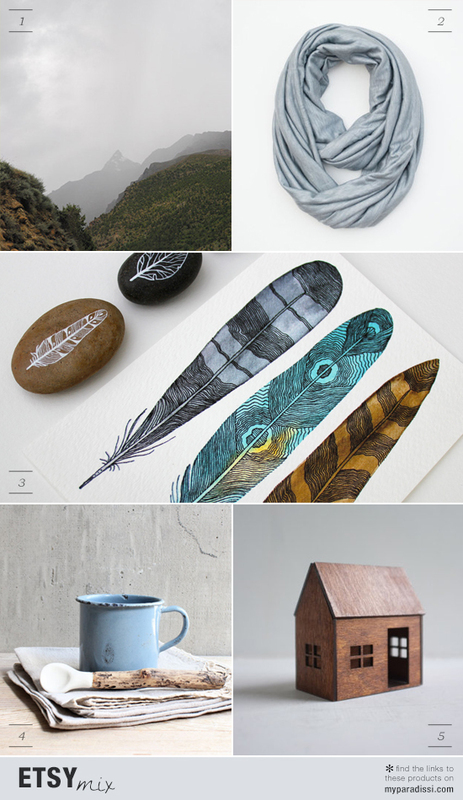 5 comments on "ETSY MIX: Misty walk"
I love Etsy and those feather prints and rocks are just beautiful. Wow so lovely Etsy !! Oh awesome! Thanks for the advice. I have yet to use Instagram though it is on my loooong list of things to do.